Sometimes you search and search for inspiration to write…other times it simply arrives home in your son’s pencil bag. Hmmm…this was a hard one for me to swallow. I agree that kids make mistakes, and have ‘oops’ moments. Actually, we all do and perfection is just not possible or desirable for that matter. If we are perfect, what’s left to learn? In my opinion, communication is everywhere and in everything. Let’s take a closer look at what this card says to students. This card considers a late homework assignment. Homework is obviously graded, yet formative work should not be scored. Why create a high stakes learning environment by grading everything? Why make a judgement about proficiency when this is a check point during the journey? Do we want kids to be concerned with points and perfection or with learning? Learning is risk taking which has the potential for failure. How do we want students to view this process? According to the card, the late homework must turned in the following day to receive any credit. A zero is stated as the punishment or repercussion if the procedure is not carried out. Tardiness with work is a behavior (although not a preferred one). Including this in the grading process makes students nervous and fearful of making a mistake. Do we care when students learn or that they learn? Afford students the opportunity to make mistakes. Talk with them about how to make a better decision in the future. Help them get there. Is a student responsible if they don’t use the card? My son did not use his card last quarter even though he missed one assignment. Does this say that he is irresponsible or simply that he is a child who can forget things at times? Let’s face it, middle school students forget sometimes. As long as it is not a consistent problem there is no need to worry or penalize a student. Did I want my son to use the card? No, but the choice was his. I was proud of his decision. Oh, the monster of extra credit. 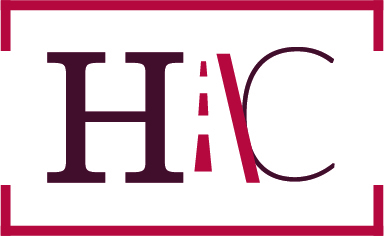 Awarding students extra credit at the end of a marking period for not using the card has absolutely nothing to do with their academic achievement. Even so, what would 15 points do for a student who has been very compliant with homework throughout the quarter? My guess is not much. Would it help with a student who consistently struggles to turn in work on time? Nope. I adamantly disagree with extra credit for so many reasons that it most likely warrants an additional blog post. Cards like this do not communicate the importance of learning to students. They switch the focus to compliance, points, scores, and grades. According to the card, it is acceptable to make one mistake per quarter, and it must be resolved in one day. After that, perfection is the expectation. This is not realistic. This is not learning. What are your thoughts? Leave your comments and continue the discussion. I find it interesting that a teacher would make such bad practices so public. I agree with what Danny said and how you analyzed it Garnet. It shows me that, after twenty years in the grading ‘wars,’ is there is still much to do and many teachers to change. Now that I’ve gotten that out of the way, I truly believe that its misguided attempt to teach young people “responsibility” that is destroying the very fabric of the modern educational system. As you and I both talk about frequently, punishing students for not completing their assignments and merely giving out zeroes does nothing but reinforce that not doing your work is the easy way out. Additionally then the emphasis is on completion rather than understanding. Add to the fact that in most classes any repercussions for not doing your work is at the least a few days removed up to weeks away, it is clear to me why entire generations of young people hate school, learning, and struggle the whole way through their educational career. I just dream that one day all educators will think about this issue as deeply as you and others involved in the standards based movement are. That way many more students would be able to achieve their own success stories. I know that life is all about “agree” and/or “disagree”, but I cannot possible be in more agreement with everything you’ve said in this post. Thank you so much for taking the time to share your thoughts with us on this topic. I see this (as you’ve stated) as the age-old struggle between “learning” and “getting a grade”. This card is probably intended to encourage responsibility, but it really says to the student is that following directions is more important than learning. Every we do should be about the learning. Oh my gosh, I just read my comment and saw that I made two mistakes in my first sentence (!). I meant to say, “…life is not all about “agree” and/or “disagree”, but I cannot possibly be …” I’ll proofread my comments in the future. Sorry. How would you model having a conversation with this teacher on behalf of your son and/or all other students in this class? I am always pondering the conversations I could have with these teachers. I also would love ideas from others who have similar views on standards based learning and the types of conversations that can begin shifting and moving teachers grading practices towards #sblchat. 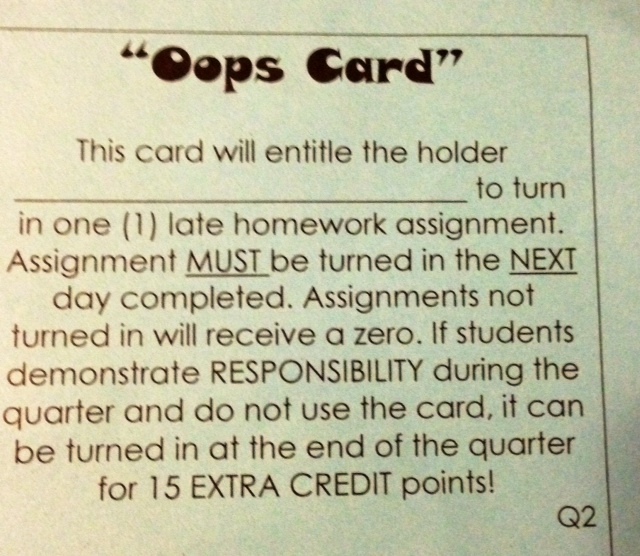 Read the oops card to my daughter who is in her 2nd year teaching 3rd grade. She burst out laughing- made me proud. Great job breaking it down Garnet and it would be funny if it didn’t harm children by shutting them down. Just scratching the surface of how ridiculous the Oops Card is. I began to embrace SBL after my daughter was out of high school so I never dealt with this, but how difficult it must be. To see what messages are being sent by grading practices and have a child in the middle is not an enviable position. The one potential positive is that facing adversities like the oops card and graded practice may enhance his perserverence…and yours!